Recently I have had a requirement to deconstruct XML in SQL Server and present fragments of that XML to users as field values. This can be achieved relatively easy using a combination of XQuery/XPath against XML data that stored in fields within an SQL Server table. We’ll start by looking at some simple cases and then look at more complex XML considerations. In my simplest example, I’ll be using a snapshot of XML from books (you can find the full version here) and I have included what I am using below for clarity. In our first example, we assume that the XML is included as a chunk in a field and therefore, we can define an XML column with the following SQL. You’ll notice that the query results look like the following. Clicking on (a cell) from the xml_content field will open up the XML in a new window. There are really two parts to the field I added. 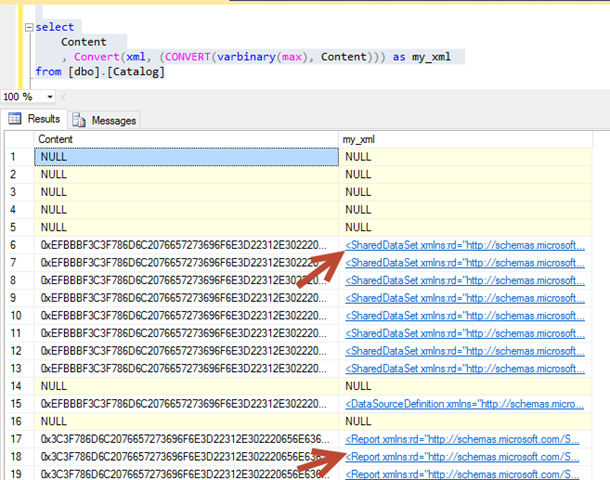 Firstly we use the .query method to parse an XQuery against the XML column. You can read more about the query method here and XPath here (actually the XPath link includes some good examples for XPath). If your not too familiar with XQuery or XPath, there are several things to note in the query that I’ve used (ie the ‘/catalog/book/author/text()’. First, it follows the document structure and you can select nodes by using the delimited structure starting at the root node. The first / refers to the root and then we define the nodes of the document that we want to see which are delimited by name (for example a collection of book nodes is defined by /catalog/book/). Secondly, I can refer to a particular node by specifying its index. This is done with the square brackets after the book node (ie book refers to the first book node – the book with the ID=”bk101”). Finally, I can extract the nodes value (text) by using the text() function. That’s the text between the the nodes opening and closing tag. Of course, the return type is XML so if I wanted to convert it to a text type I would have to cast. For something a little more interesting (and perhaps more practical), I recently needed to extract the some dataset information from an SSRS Server (actually, it was the query for datasets). Datasets and other information are included in the report server database Catalog table. Its an interesting table (perhaps one may argue that its not entirely relational) because it includes different types of objects however content data (the XML relating to an object) is stored in an Image format so the first step is to convert it to XML. You may think that the use of an XPATH expression ‘/SharedDataSet/DataSet/Query/CommandText/text() would define the nodes text (for the dataset). Unfortunately, the query (the field dataset_query in the output) is blank – Try it for yourself. However, suppose I want to include the namespace in my query (say for example the first field type), my query now becomes.